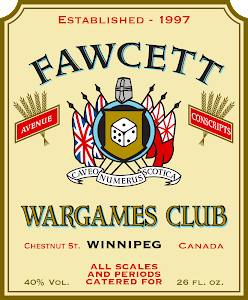 Fawcett Avenue Conscripts: 28mm Great War French and Verdun Battle Report! 28mm Great War French and Verdun Battle Report! It's always nice to see the back side of a painting project, don't you agree? In this case, it's the culmination of a massive amount of batch painting, to the tune of over 50 models at once. These are the Foundry "26mm" late-war French from the Great War period. Test model in progress. This project was an unusual one in that I was trying not only to get some reasonably historically accurate colours on the models, but also to match 30-odd models that had been painted by another wargamer already. Let me explain... when friend of the Conscripts Glenn S. passed away suddenly in 2015, he left behind a sizeable collection of models in all kinds of scales, painted and unpainted (and in stages of painting, as you might expect). One of Glenn's passions was the Great War, and I was fortunate to be able to purchase his collection of Great War models from his estate. Some were unpainted, but many were painted, including over 30 late-war French in horizon blue. Unfortunately the exact formula for Glenn's paintwork died with him, and although I had sourced another 50-some castings to make up a viable "army", I was at a bit of a loss as to how to paint them to match. Happily though (and after a bit of a false start) I hopped down to our local GW and chatted with Mark, who made some suggestions to match the horizon blue. To "blood" the new French we set up a Verdun game. It seemed apropos that it was scheduled three times before we finally played. The scenario had the French attacking the ruined village of Fleury. They had eight turns to roust out the German defenders, who numbered about half of the French force. The attack started with a gas barrage, which took a few casualties off the Germans, but accidentally decimated a French command section as well! French infantry make their way across the cratered hellscape. Captain Lefebvre, the sole Frenchman to make it to the German lines, prepares to sell his life dearly! Others infiltrated forwards through a communication trench to the German front. Storming party ready to retake the ruined village! However, in the true spirit of France, I set up the whole painted army on the terrain for a little impromptu photo session for propaganda purposes. The trench boards are so atmospheric it'd be a shame to let the opportunity go to waste. I really like the Foundry Great War range, despite its infuriating incompatibility with any other modern range of WW1 models. Fortunately though, the Foundry range is pretty comprehensive - I just realized that I forgot to photograph the two 75mm guns and crew that I'd painted! Zut alors - but perhaps a mini-post of those models will be in the cards for the future. Great work Dal and a fitting tribute to Glenn. I like your take on the tricky French 'horizon blue'- well done! You‘ve done an excellent job in matching Glenns figures! Lovely figures and terrain- I'm sure Glenn is glad they're getting used. Nice work on matching the figures to Glenn's. They all look superb. The table looks great as well. What a touching post and such a fitting tribute. Cracking game. Great job on the horizon blue, and the whole force turned out nicely. As for the game, new figures have to die do they not? It is the way of things. I LOVE your terrain boards! The Poilu look great too! The photos are lovely, but everything is even more fun in person. That was an excellent game, and the painting is top-shelf. Thanks all, I really appreciate the comments.